Plan a fun entrance for your ceremony. The JK wedding entrance dance video has introduced thousands of couples to unique and creative ways to have fun with their wedding ceremony. While couples have always found ways to write personal wedding vows, choose special readings, or otherwise add unique twists to their nuptials, a crazy entrance dance is a new and exciting option for a wedding ceremony. When Jill Peterson and Kevin Heinz married on June 20, 2009, their wedding entrance dance surprised and delighted their guests. Rather than a solemn, stately walk down the aisle, the couple opted for a high energy, enthusiastic wedding processional instead. The couple chose Chris Brown's Forever as their processional music, and their ushers, bridesmaids, and groomsmen grooved their way down the aisle with fun and easy dance steps, including arm and hip movements, different tempos, and even handstands. When the groom appeared, he somersaulted through the attendants on his way to the altar, and the bride boogied alone up the aisle and met her groom halfway. Together, they swayed with the beat for the final steps up to the altar. The bridal party had practiced their moves for nearly two hours before the ceremony, and each attendant was able to do moves that suited them rather than more highly structured and demanding choreography. While unexpected, the dancing processional was well-received by the couple's guests, who clapped along with the song and encouraged the dancing. A month after the couple's wedding, a video of the dance was posted on YouTube. It quickly became one of the site's most-watched videos of 2009, and by April 1, 2010, had received more than 46.5 million views. Because of its popularity, the couple has established a website, www.jkweddingdance.com, for viewing the video and donating to the Sheila Wellstone Institute to help end domestic violence - a concession made after disputes about Forever copyright violations arose. Is a Wedding Entrance Dance Appropriate? Formality: This type of ceremony entrance is a fun option, but it would not be appropriate for a very formal wedding. Instead, it is best suited for a lighthearted, casual event. Religion: Couples who are planning a religious ceremony may not be permitted to arrange something as outrageous as an entrance dance. Couples should speak with their officiate and explain their wishes before planning an entrance dance, and both the choreography and the music may need to be approved. Bridal Party: A crazy dance may not be comfortable for every member of the bridal party. Couples should ask their attendants' opinions about the idea to ensure that everyone is willing to participate. If some attendants are not willing or able to be part of an entrance dance, there may be other ways they can be involved. Logistics: Depending on where your wedding ceremony may be held, it may not be possible to have the type of entrance dance you envision. Check for appropriate sound systems, aisle obstacles, and other physical characteristics of the site that could hamper a ceremony dance before you plan choreography. Keep the aisle clear for dancing. If you want to plan your own version of the JK wedding entrance dance, some careful consideration is necessary to be sure the processional comes off well. Choose attire for the groomsmen and bridesmaids that won't be hazardous for a ceremony dance. Shorter skirts, casual shoes, and looser fitting tuxedos will help your attendants show off their best moves without dangers of tripping or damaging their clothing. Choose music that matches the mood of the dance. Lighthearted, romantic songs are best, and they should have a tempo that works well with dancing up the aisle. Be sure to preview the song's lyrics for appropriateness. Keep the choreography simple and fun. Allow your attendants to choose their moves to match the song, and don't worry about having each person coordinated with the group or using elaborate dance sequences. 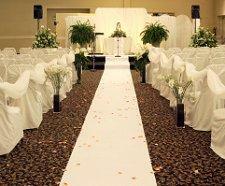 Keep the wedding aisle clear of decorations and other potential obstacles. The aisle should be wide enough for the dancing, and firm enough for secure footing for everyone involved. Practice the dance before the ceremony. If possible, practice several times during the days leading up the wedding to give everyone time to learn the music, become accustomed to their moves, and coordinate with one another throughout the dance. If creating a wedding ceremony entrance dance isn't right for your event, there are other dances you can personalize and have fun with at your wedding. Many couples choose elaborate and fun choreography for their first dance, and you can also create a momentous last dance to close your reception. A choreographed bridal party dance or wedding party entrance dance are other fun options for personalized dances. The JK wedding entrance dance quickly became a phenomenon that took not only YouTube, but also the wedding community, by storm. With that inspiration, couples now have another creative option for personalizing their wedding ceremony in a fun and unusual way. While a ceremony dance may not be right for every couple, it can be a great way to make your wedding even more memorable.